By: Dima posted on February 07, 2018 in Free PSD Mockups . Our new Freebie from MockupFree is ready to be downloaded! Beer Cup v2 – Free PSD Mockup can be useful for graphic designers, product promoters and creators. Download this Free mockup in PSD absolutely free for adding there the necessary design and logos. If you think that this mockup is necessary for promoting your product, project or business idea – download it and make it perfect the way you wish. We sincerely hope that this awesome free mockup PSD will be useful for you, your company or your clients and bring you lots of positive benefits in future. Download and enjoy this useful Free PSD mockup and make any necessary customizations. Hope this awesome mockup will be useful for you! 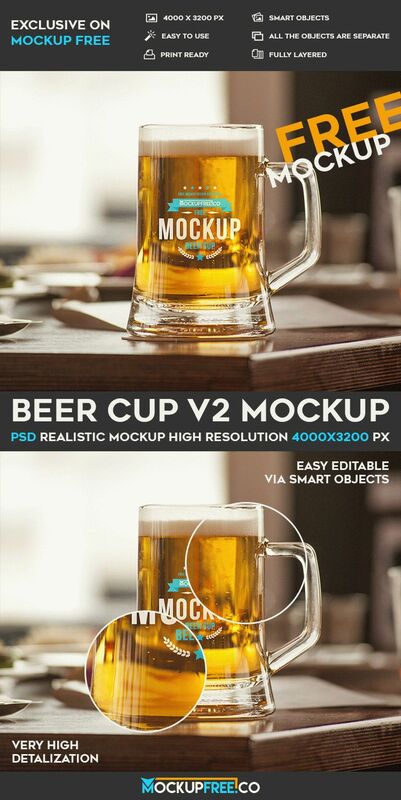 This Free Beer Cup v2 mockup can be good for implementing a lot of designers ideas as well.